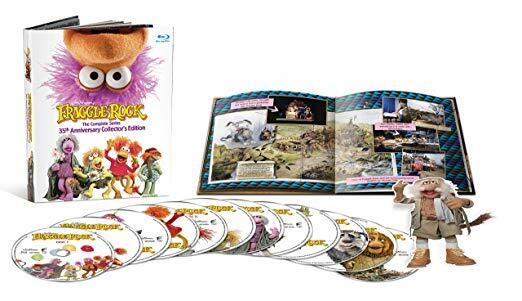 Sony’s Blu-ray release of Fraggle Rock: The Complete Series, is one of the consummate bargains, at a street price of under $50. A Henson property, owned by Sony, it’s been slightly spruced up (tech term), and presented in Blu-ray. 2,373 minutes – 96 episodes. All originally in standard def – 1.33:1. This is one of the few words columns that you’ll read that sets quality aside, for content. And it’s the content, which back in the ’80s, beginning in 1983, became safe, educational, kid-friendly programming, that was also able to entertain adults, along with their progeny. I know, because it was one of my son’s favorite shows, even though it hit the airwaves before he was born. Somewhere I still have a laserdisc, as viewing was a necessity. There aren’t enough superlatives that can be used to recommend this programming, so I won’t try. For those with young children, just grab a copy, and make believe you’re viewing on your 35″ Mitsubishi tube set. Pretty sure Fraggle Rock was actually shot in PAL 50i, not NTSC. You could be correct, but doubtful. It was a produced in Canada, which was also NTSC. AFIK, it was 720 x 480, 29.97i. Robert: Why is the Image Quality an "NA?" I saw your comment about setting aside quality for content in this review, but yet you graded the audio a "5." So why no grade for the video? I have only sampled a little bit of the set but I am already in awe of how they managed to make it look better than ever, exceeding my admittedly low expectations for content shot on tape in the early 1980s. It's better than DVD by a country mile, it's OAR, it still looks like tape without the cheesy-fake "filmlook" image processing, video noise is minimal, it doesn't look smeary like the worst of Disney's attempt to pass off second-rate work as being "digitally restored and remastered," and the frame rate seems fine. And the company who did it has been busy with other clients, so hopefully we'll get to see even more examples of there work. This set might just be a DVD-killer. No longer will "but it was shot on tape in the 1980s" be an acceptable excuse to settle for less than the best potential picture and sound quality given the source materials. It won't solve the ongoing music rights bugaboo, but it will open new doors for shows long thought only suitable for DVD and standard definition rebroadcasts. My only regret, though, is that the 13-episode NBC animated series from 1987-1988 (produced through the same production deal with Marvel that resulted in Muppet Babies) wasn't subjected to the same process so it, too, could be brought up to HD quality. Simple. Audio was fine. But the image would have been generally seen at 27” or smaller. Any modern viewing platform will be unkind. Again, content supersedes image quality. You like the show so much that it's worth owning, no matter what. But the image is pretty much a 1 or 2…for all practical purposes. Or, if you'd like, a 5…but as nicely as the source material has been replicated, don't expect miracles that the 480 lines of resolution is going to look very good on modern sets. I have a 136" 2.35:1 constant image height projection screen on which a 4×3 image is effectively 70 inches wide and 53 inches high. That is about twice as big as Mr. Harris's theoretical Mitsubishi, although mine would have been a 32" Toshiba on which I watched 1990s basic cable reruns. So at that size, it magnifies a lot of flaws. Most of the flaws present in DVD representations of analog tape material—dot crawl being one of the worst—aren't found here. It's not "true" HD in the sense that it wasn't shot that way since HD as we know it now didn't exist yet, but it's way better than a DVD upconvert would be. I'm sure someone who also owns the DVDs will make a comparison video soon enough. The true test is whether the discs hold up to a 4k upconvert through either the player or receiver. Unfortunately, I have yet to go 4k simply because there aren't enough movies and shows I actually want in the format yet. I hope Disney considers this process for The Muppet Show; that originated in PAL 576i50, so an upconvert should be able to capture the full resolution and make it playable on an American HDTV. I find that DVD’s MPEG2 encoding can be just murder on stuff shot on SD tape. The small number of BDs that I have which feature SD tape sourced material look so much better just due to the better codecs and compression used. I’m in favor of releasing SD material on BD just for that reason alone. Are you speaking of the Ugly 6 S2 episodes or some other issue? I guess I just don't see the point of upscaling SD material. The only benefit I've been able to discern is that the compression method used on today's Blu-rays does a much better job of handling color than MPEG2 does. It still ends up looking like cleaner SD video. I have a few Blu-ray sets that are comprised of SD material that is left at 480p. It looks as good as SD video will ever look, but is able to take advantage of the superior compression and sound that Blu-ray affords. You can also fit quite a bit of SD video on a Blu-ray. The only reason I can think of for more companies not going this route is that they are able to fool less-knowledgeable folks into thinking they're somehow getting a big visual boost and can charge more for the product. I have yet to see an upscaled transfer that was any better than a well-encoded SD file. Can anyone give me any examples that would change my mind? The only benefit I've been able to discern is that the compression method used on today's Blu-rays does a much better job of handling color than MPEG2 does. It still ends up looking like cleaner SD video. That, to me, is the benefit. Especially on larger displays, the compression artifacts from older DVDs of video material become readily apparent, whereas on a BD, it just looks like video without the extra “noise”. For concert/music material, the BD usually has the added bonus of lossless audio which can be a nice perk. But I agree that there’s no mistaking it for true HD. I also think it is because the Blu-ray Disc Association requires the main feature to be in HD. FWIW the Videotape 6 did have some minor clean up work (mostly in noise reduction) for blu-ray…and Night of The Meek was actually from the tape this time. I don't believe that's the case as I have a couple of Anime series as well as an ELO disc where all of the material is SD video formatted for Blu-ray. It allows them to pack a lot of material onto a single disc. I remember watching and videotaping these as a kid when it was on HBO if I recall. Amazing this made it to Blu-ray, but pretty cool!